The Legacy event — which will revise the issue numbering of many of its titles to restore their original numbering, or something close to it — released today, and it recalled that more than a decade ago, I had written a piece on what I termed "legacy titles" and their numbering for Comics Buyer's Guide, along with grids showing every title numbered above #100 at five year intervals beginning with 1935. 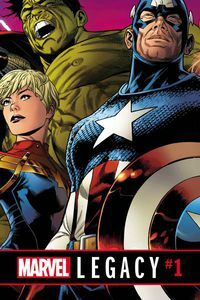 So now that readers have had a look at Marvel Legacy #1, I offer an updated list of those titles here on the site in our FAQ section: "How Legacy Numbering Has Changed Over Time." In addition to adding data for 2010 and 2015, there's a new essay about the origins of whole numbering in comics and the reasons that publishers have restarted titles in the past, as well as some reasons why, as Marvel has, they sometimes seek to recover a series' original numbering. Additionally, I have a graphic showing how legacy numbering has changed across time, which clearly depicts the trends involved. You can see when several of the older publishers went away at once; likewise, you can see the echoes of events like Crisis on Infinite Earths. And depending on how long Legacy's changes continue, there may be significant shifts in the 2020 table on the next update. Time will tell. While comics shop orders during the month of August 2017 were down in all categories versus last August's blockbuster, we've finally found a book that's been able to top a mark set in that summer of DC Rebirth launches. And it's another DC book: Comichron estimates that Diamond Comic Distributors shipped almost exactly 262,000 copies of Dark Nights: Metal #1, the kickoff point for this fall's Metal event, to North American retailers in the month — quite a few more copies than the 235,800 shipped of DC Universe Rebirth #1, the corresponding launch book, in its first month. Click to see the full estimates for comics sold in August 2017. After that first month, of course, Rebirth #1 would go on to multiple printings and top 300,000 copies in North America — but Dark Nights' second printing reached shops last week, and there's something else of note: Dark Nights cost $2 more, at $4.99. It's also marked by Diamond as the number one dollar title of the month, and if all copies sold at cover price, it's not just the top-selling comic book of the year in units, but also dollars, eclipsing the $10 Amazing Spider-Man #25 earlier this year. Click to see our running track of top sellers in 2017, along with our market shares for the year to date. The internal benchmarks also showed something positive: the 300th place comic book, Jimmy's Bastards #3 from Aftershock, moved 5,621 copies in North America, which is more than any book in that position in a five-week month since December 2015. While it may not be particularly meaningful as wins go, it's surprising that any position on the chart could be higher against last August, a month in which far more comics moved overall. 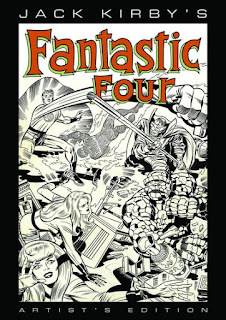 On the graphic novel side, we find that the top-dollar book for the month is quite a ways further down the unit sales list: IDW's Jack Kirby Fantastic Four Worlds Greatest Artist Edition hardcover, a $150 book on the shelves in advance of the King's 100th birthday. The larger picture of this August versus last August has been previously elaborated here; the market year-to-date is off 10%. But 2017 has big events yet on the slate with Metal and Legacy yet to come, and while there remain strong comparative months to come, the potential for a changed dynamic is there. Sometimes retailer money's on the sidelines, waiting for the right event; sometimes it just isn't there. This fall should tell us which is the case. The data sheet for the month follow at the bottom of this post, but before that, I would like to remember Len Wein, comics writer and editor, who passed away on Sunday. Len is a large part of the success comics found in the Direct Market era, from his reboot of the X-Men and his introduction of Wolverine to his hand in developing comics for more sophisticated audiences with Swamp Thing. I had the good fortune to spend some time with him at a convention several years ago and he was generous with his knowledge and his advice. His works were and are a big part of so many comics readers' lives, and I'm grateful to have had the opportunity to know him. He is already missed. Full-line relaunches of the scale DC engineered in 2016 with "Rebirth" and 2011 with the "New 52" are colossal market-distorting moments, making a hash of the comparative statistics both when their sales are reported, and when any future month's sales are later compared with them. It takes a while for a revamped line to find its new equilibrium—sales levels that are achievable regardless of variants or the issue number on the cover—and only then are month-to-month or year-over-year comparisons of much use. So when I warned a few weeks ago that August 2017 would not be the month to look to for any kind of revival in the comic shop market's fortunes, there was good reason: August 2016 was the epicenter of the Rebirth sales earthquake, with more than 10 million comic books shipping. It was the first time that mark had been seen in two decades, thanks in part to the Rebirth titles being returnable. Consequently, sales for last month were way off the previous year's pace, according to this morning’s report from Diamond Comic Distributors. Shipments were down 26% in new comic book units, and overall retail dollars spent on comics, graphic novels, and magazines dropped by nearly 21%. Comichron calculates that $45.7 million in product shipped, down from the previous August’s 21st century record of $57.7 million; we also have revised our July figure down slightly here on the site, to $40.76 million. (Both Augusts had five shipping weeks, so that's not a factor.) Overall sales stand at $347.67 million, down about $41 year to date, or about 10.5%. These are, in historic terms, significant drops. The period from June to August was down 20.5% against those Rebirth/Civil War II months a year ago, the worst three-month year-over-year comparison since… well, we have to go back 20 years to September 1997 though November 1997, the first set of year-to-year comparatives I ever calculated. 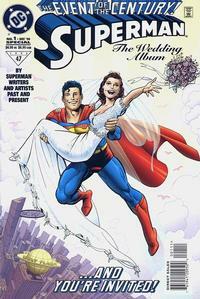 Marvel’s “Heroes Reborn” event in September 1996 and the wedding of Superman had been succeeded in 1997 by “Heroes Return,” which didn’t fare as well. Top 300 unit sales in that three-month stretch in 1997 were off 21.9%, and graphic novels, while growing, weren’t yet much of a factor. There are certainly worse year-over-year drops in the 1990s before that. 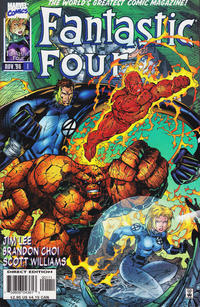 But while the 2017 drops are up there on the list, “Heroes Reborn” only rebooted four titles; a bigger explanation for the 1997 collapse, even beyond reboot fatigue, was the number of comics shop failures. Absent that in 2017 and given that DC relaunched so many more books, the scope of 2017’s comparatives may say more about Rebirth’s strength last year they do about conditions today. So once you catch your breath after reading those numbers, it’s worth looking at some things going on under the surface. It’s no surprise that DC’s August sales weren’t able to come remotely near comparing with its performance last year; the company had been tracking ahead of its 2016 performance earlier in the spring, but now accounts for about a third of the industry’s 2017 shortfall in the Direct Market. On the other hand, August wasn't a bad month for DC, volume-wise, when compared with more normal recent months; its sales were actually higher than the last five-week pre-Rebirth month in 2016. 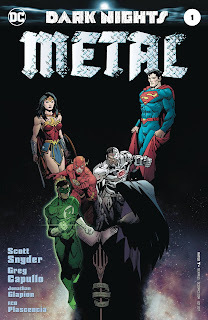 DC had the top seller in Scott Snyder and Greg Capello’s Dark Nights: Metal #1, the launching point for DC’s fall event; the second printing of the issue went on sale this past Wednesday. Priced at $4.99, it stands a chance at being the publisher’s release of the year in dollar terms, given how the cheaper lenticular and non-lenticular Batman issues added up. The first issue of Rebirth was priced at $2.99; once we see the full numbers on Monday, we’ll have a better notion of the scope of what might be coming in September as the Metal event gets more fully underway. Marvel’s position is also interesting. Secret Empire came to an end with three releases; #10, the finale, outranked the previous two issues. Again, through the spring, Marvel had been responsible for 100% of the industry’s shortfall for the year, but as of August that’s down to only around half, now that DC’s facing its toughest comparatives from last year. Further, while Marvel’s shipments continued to be down, it’s pared back its losses — only off around 10% this month as compared with the 21% drop the whole market suffered. With "Legacy" launching, there’s a chance for some ground to be made up. It should also be noted that after everything else that’s happened in 2017, Image, Dark Horse, and Dynamite remain ahead of where they were this time last year in terms of retail dollars ordered. Pockets of strength are good to see, because true recessionary times in comics tend to pull everything down. 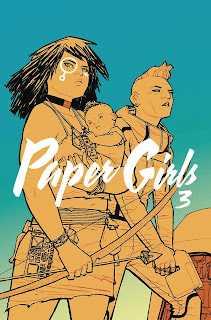 Image continues to be bolstered by strong graphic novel performances: Paper Girls Vol. 3 was the top-seller this month, and one of five Image GNs in the top 10. The full estimates will be published here Monday morning. Follow us on Twitter and Facebook to be alerted when they go online. Lastly, we've added search and sorting mechanisms to all our end-of-year charts, beginning with 1991. Be sure to take a look. Comichron founder John Jackson Miller has tracked the comics industry for more than 20 years, including a decade editing the industry's retail trade magazine; he is the author of several guides to comics, as well as more than a hundred comic books for various franchises. He is the author of novels including Star Wars: Kenobi, Overdraft: The Orion Offensive, Star Wars: A New Dawn, and the Star Trek: Prey trilogy. He has a new story in the 40th anniversary compendium, Star Wars: From a Certain Point of View, releasing October 3. Read more about that and other stories at his fiction site.